President Donald Trump says he wants to withdraw from the Intermediate-range Nuclear Forces treaty. The treaty, signed in 1987, banned US and Russian use of ground-launched missiles with ranges between about 300 and 3,400 miles. Scrapping the deal now may exacerbate tensions between the US and Europe, and it could spark a new missile race. At a rally in Nevada on October 20, President Donald Trump said he would pull the US out of the Intermediate-range Nuclear Forces treaty signed by the US and the Soviet Union in 1987. The US has repeatedly said in recent years that Russia was in violation of the treaty and that Moscow’s renewed embrace of those weapons put the US at a disadvantage. US officials have also pointed to intermediate-range missiles developed by China, which is not an INF treaty signatory, a reasons to forgo the deal. But in Europe, where many countries watch Russia warily, scrapping the deal and seeking to redeploy intermediate-range missiles is likely to be greeted with resistance and may exacerbate strains that already exist between US partners on the continent. The INF treaty was signed by President Ronald Reagan and Soviet leader Mikhail Gorbachev in 1987 and approved by the US Senate in a 93-5 vote. It banned ground-launched missiles with ranges between 500 kilometers and 5,500 kilometers, or about 310 miles and 3,400 miles. It led to the dismantling of nearly 2,700 short- and medium-range missiles belonging to both the US and the USSR. Now, however, Russia’s violations put the US at a disadvantage, according to Trump. 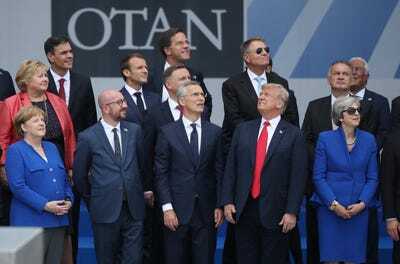 Sean Gallup/Getty ImagesPresident Donald Trump and other NATO members at the 2018 NATO Summit in Brussels, July 11, 2018. The US has not formally withdrawn, which would take six months once formal notice is given. But John Bolton, Trump’s national-security adviser and a longtime critic of the treaty, reportedly plans to tell the Kremlin of the US’s intention to pull out during a visit to Moscow this week. 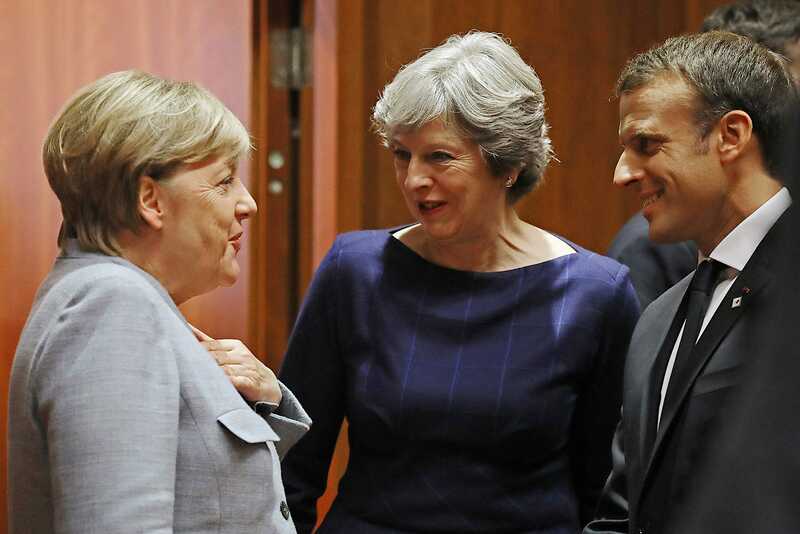 Dissolving the landmark treaty could exacerbate divides within Europe, where countries have differing views on common defence and where ties with the US have been strained under Trump. In Central and Eastern Europe, where there is “a much more hard-edged” view toward Russia, US withdrawal is unlikely to cause much concern, said Jim Townsend, an adjunct senior fellow in the Transatlantic Security Program at the Center for a New American Security. But among other longtime US allies in Western Europe – “those nations where arms control has always been an important part of a national-security regime,” Townsend said – withdrawal was likely to be much more concerning. 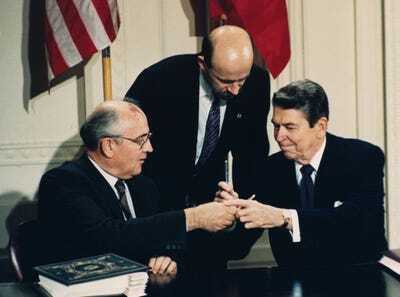 (AP Photo/Bob Daugherty)President Ronald Reagan, right, and Soviet leader Mikhail Gorbachev exchange pens during the Intermediate Range Nuclear Forces Treaty signing ceremony at the White House, December 8, 1987. On Monday, the EU called the INF “a pillar of European security architecture” and said the US and Russia “need to remain engaged in constructive dialogue” to preserve it and ensure full implementation. French President Emmanuel Macron addressed withdrawal with Trump in a phone call a day after he announced it, “underlin[ing] the importance of this treaty, especially with regards to European security,” the French Foreign Ministry said. Tensions between Russia and other countries in Europe have been elevated since 2014, when Moscow annexed Crimea and militarily intervened in Ukraine. That year, the Obama administration said publicly for the first time that Russia was violating the INF. At the end of 2017, a National Security Council official revealed that the Russian missile causing the violation was the Novator 9M729, a land-based cruise missile designated by NATO as the SSC-8. Russia has also accused the US of violating the treaty, pointing specifically to the Aegis Ashore ballistic missile defence system, which Moscow believes could be repurposed for offensive uses. The US has rebutted those claims, which are part of “a false narrative” about Western missile-defence systems pushed by Moscow, said Townsend, who was deputy assistant secretary of defence for European and NATO policy during the Obama administration. But by ditching the INF treaty now, critics say Trump is abandoning potential solutions and may find European partners uninterested in a renewed missile presence. “The United States wants the Russians to verifiably dismantle the currently deployed 9M729 missiles and provide inspection opportunities so Washington can be sure the missiles are no longer being produced,” Bell said. “Russia wants to be assured that our missile-defence installations cannot be used for offensive capabilities,” which could be done through inspections. Russia has criticised Trump’s plans to withdraw – Gorbachev called it “not the work of a great mind” – saying it could trigger a new arms race in Europe. Moscow has said it was willing to work on mutual grievances with the current treaty. On Monday, Trump reiterated that Russia had violated the agreement and said “until people come to their senses … we’ll build it up,” appearing to refer to US nuclear capabilities. He included China in his comments. But finding countries in Europe to host new missiles may be a challenge. While the UK, West Germany, the Netherlands, Italy, and Belgium were willing to host hundreds of so-called Euro-missiles in the 1980s, “None of them appear willing to accept them now,” Michael Krepon, cofounder of the Stimson Centre think tank, wrote on Monday. Even Germany, where NATO bases and infrastructure may become priority targets, may not seek additional defences. Berlin would likely signal very early that it would not host missiles should the US seek to return them to Europe, Townsend said. It would show Berlin that the US it is used to dealing with is “continuing to trend in another direction,” Townsend added. Dan Kitwood/Getty ImagesGerman Chancellor Angela Merkel, British Prime Minister Theresa May, and French President Emmanuel Macron at a meeting in Brussels, October 19, 2017. The Trump administration has yet to give official notice of INF withdrawal. While lawmakers have expressed dismay at the idea, there is little they can do to stop it, but they do have leverage over what would come next. Congress can withhold or limit money for ground-launched intermediate-range missiles, which the treaty currently prohibits. The Senate would also have to approve any replacement treaty worked out by the US and Russia. The six-month exit period would also gives time for additional pressure to be brought to bear on the US and Russia.